Golf can be a daunting game for even the most experienced (not necessarily good) golfers in Thailand. Luckily Bangkok is an ideal place for beginning golfers in Thailand to tee it up. With the helpful caddies at all Thailand golf courses, beginning golfers are able to play with experienced assistance at their side for the whole round. For example, golfers in Thailand sometimes forget the basic things that a new golfer struggles with, for example finding the next hole, observing basic golf etiquette and knowing distances to the hole. The caddies in Thailand can help with all these things and more. Another reason why Bangkok is a good place for beginning golfers is that most of the golf courses do not require you to have a handicap card or be able to play the game to any level. This can be quite frustrating if you happen to be caught behind a group of new golfers, who might not even know the etiquette for letting people through. For the beginning golfer, you can show up at most courses in Bangkok and it doesn’t matter if you shoot 160! Alpine Golf Club is one of the few courses in Thailand that does not allow beginning golfers to play and requires a 24 handicap for golfers to be able to tee it up. Perhaps the best reason for a beginner golfer to tee it up at golf courses in Bangkok is that many courses, especially the ones a little further out of the city, are empty during the weekdays to the point of sometimes you feel like you have the golf course to yourself. This is a big bonus for new golfers who seem to struggle more when there are more people about. 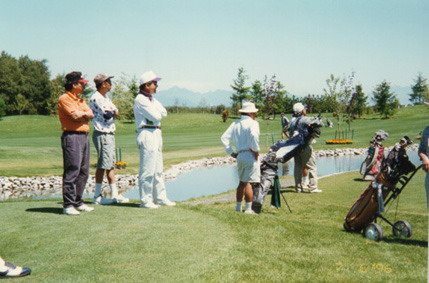 One of the most frightening experiences for a new player is to go out and try to hit a tee shot when you have 4 groups watching you. My recommendation for beginner golfers in Bangkok is The Vintage Club, located about 45 minutes from the city, it’s a little further out and because of this can often be found empty. They tend to keep the rough short and manageable and the greens are fast without being frightening. Another good course for beginners is the par 3 course at Bangkok Golf Club. For only 100 baht this is the most cost effective way to practice your golf. Plus the course hardly gets any play and when you feel up to it you can always go over and play the full 18 at the sister course on the same site.